Give a little, get a lot! Help us change lives! The only way that Heart of the City can continue to grow and provide access to our programming to more children is through the commitment of dedicated volunteers, who serve as our recreation league’s coaching staff. Lending their time and talents, these individuals ensure each child gets a terrific HOTC experience. That’s really what it’s all about: Kids playing a sport they can enjoy for life. You don’t need to have played soccer or know much about it to coach, particularly at the lower levels of play. Many coaches learn the game along with their kids. 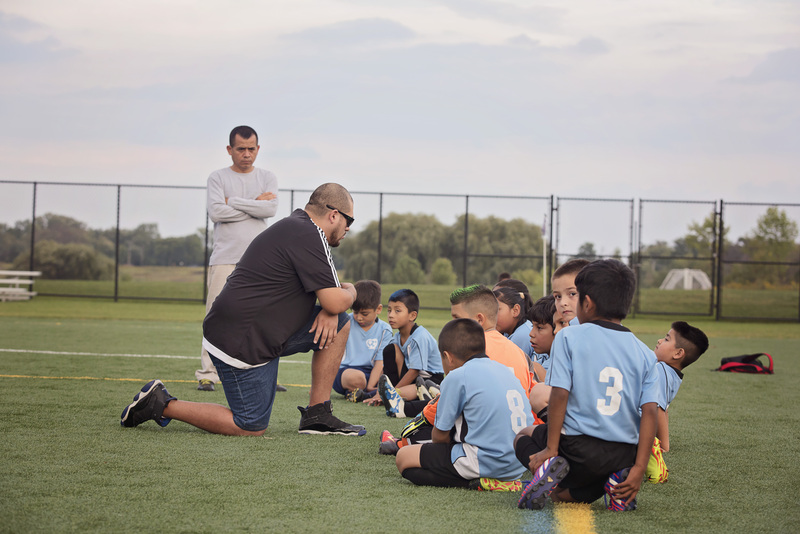 We’ve developed special intake processes for new coaches that help parents who may have little or no soccer experience quickly gain the age-appropriate knowledge and skills they need to be effective coaches. It only takes a few hours to become qualified as an introductory-level coach. We also offer clinics and workshops and other advanced training throughout the year as well as assistance with US Soccer Coaching certifications on a case-by-case basis. Throughout a season, coaches and assistant coaches participate in roughly 2-3 hours of practice and 1 hour of games each week. If you are up for the challenge of creating a fun, learning soccer environment for your players in training and in games, please submit a volunteer application and agree to have a criminal background check completed.